It was only in the last couple of years that the number of laptops shipped annually exceeded the number of desktops. I can still remember the thrilling moment when my boss agreed that it would be a "good thing" if we began moving most of our professional staff from desktops to laptops. Our office, like many, still has to deal with occasional issues about when it is or is not appropriate to have a laptop open during meetings, but mostly we do have them open. Maybe this epitomizes my geek status, but I get a thrill out of seeing my colleagues sitting around a table during a staff meeting, discussing something projected up on a screen from one person's laptop, and each with their own open laptop in front of them. It's as though we have all of those creative minds present, working with each other, and in front of us "windows" to just about anything we need to know to continue discussions without ever a hitch for missing data or background information on something. The question of laptops versus desktops has been making the rounds on the university IT lists as well. On one campus, faculty members are offered a choice. If they choose a laptop, then it's their departmental budget that purchases a docking station. That institution is considering offering the docking stations from the central IT budget in order to induce more members of the faculty to select laptops. Another campus IT staffer offered up that they were addressing some of the same issues, and the security concerns regarding possible sensitive data on portable machines was an additional issue they were struggling with. Yet another campus uses the same model with regard to the docking station being out of the departmental budget and notes that they have a three-year refresh cycle for new machines. At this institution, faculty may choose Mac or PC. Another, fairly small, institution also allows the Mac/PC choice but refreshes every four years and does not provide any laptop peripherals from the central IT budget. It prefers wireless, viewing docking stations as mere ways to handle various cables, and jumpstarted the laptop selection process by providing one, initially, to each department so that faculty could see the utility the person using that one gained. At a state university, the scenario is pretty much the same as at the institution noted directly above, except that there is no Mac choice. At that same university, vice presidents determine whether employees in their departments get laptops or desktops. Another CIO chimed in on the security issue: That school's policies do not allow sensitive data to reside on any portable device. Instead, they provide a substantial virtual drive presence and access via the LAN and the Internet. A Canadian institution notes that they've been providing a laptop/desktop choice for several years and have found docking stations to be a waste of resources. Another university moved to providing laptops for all faculty the year before they instituted a "required laptop" policy for students. It tries to accommodate faculty peripherals requests. A Midwestern university representative noted that they had just started a small laptop initiative with 20 faculty receiving laptops, mice, and security cables. Given that the laptops have 17-inch screens, they felt no need to have docking stations and rely on wireless. Finally, another large university noted that they had been providing faculty with laptops since 1999, including docking stations when requested. The IT department encourages wired connections with faculty, especially when faculty members are working with sensitive information, such as grading. Now, all of this, of course, is great information for campus IT staff starting to consider the laptop option. 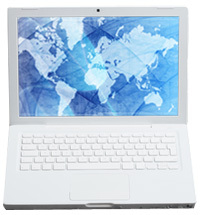 Resources like the Educause CIO list will be crucial as universities continue to make the shift as the power of laptops continues to increase--with multi-core processors and an ever-increasing array of standard connectivity and multimedia feature--while costs decrease. The discussion cited above also speaks to the astounding global resources available out there through professional discussion lists--available to you just about anywhere, anytime, if you happen to be on a laptop yourself. The entire conversation above took place between 11:06 am and 2:59 in the same day, and the information was quietly and painlessly downloaded into the inbox of everyone on the list. Members of the list can choose not to even look inside this discussion, if it's not pertinent to them, due to the single, shared subject line. I still can get a sense of wonder out of this stuff. The discussion provided not only a lot of useful information in response to the initial query, but the person requesting the information also knows the full contact information for people who took the time to respond and can call any one of them to find out more; especially if the response indicated a similar situation and a similar school. It goes to show that a good e-mail list is sort of like having all of the creative minds in an organization, and more, virtually around your staff meeting table. The best online discussion list I know of is UWEBD (for college and university webmasters). (Note: I am the manager of that list of 2,500 people; it's never had a flame war!) Another great one is CUE-L (from CASE, for editors of college and university magazines and periodicals). If you're old enough, try stepping back in time and imagining describing this incredibly valuable resource to someone in 1985. I would have found it fascinating had someone described this to me then. Of course, if I were to be able to go back in time, briefly, I might leave "spam" out of the conversation.